Membrane Contactors: Fundamentals, Applications and Potentialities, Volume 11 covers new operations that could be efficiently used to improve the performance of a variety of industrial production cycles in applications ranging from biotechnology to agrofood. This book focuses on the basic "principles of work": required membrane materials and properties; major operating parameters; the importance of module configuration and design and; the performance of membrane contactors in specific processes. 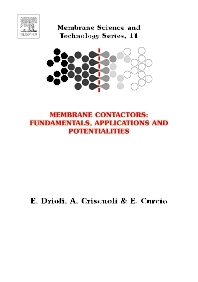 The authors’ dynamic approach to this subject makes Membrane Contactors: Fundamentals, Applications and Potentialities, Volume 11 the most comprehensive book currently available on all aspects related to the 'membrane contactor world. Enrico Drioli is Emeritus Professor at the School of Engineering of the University of Calabria. Founding Director of the Institute on Membrane Technology, CNR,Italy. Since 2012 Distinguished Adjunct Professor, CEDT King Abdulaziz University, Jeddah Saudi Arabia; since 2010 WCU Distinguish Visiting Professor, at the Hanyang University, Seoul Korea; His research activities focus on Membrane Science and Engineering, Membranes in Artificial Organs, Integrated Membrane Processes, Membrane Preparation and Transport Phenomena in Membranes, Membrane Distillation and Membrane Contactors, and Catalytic Membrane and Catalytic Membrane Reactors. He is involved in many International Societies, Scientific Committees, Editorial Boards, and International Advisory Boards. Currently Chairman of the Section on "Membrane Engineering" of the European Federation of Chemical Engineering and coordinator of EU-EUDIME Doctorate School on Membrane Engineering. He has been coordinator of several international research projects. He is the recipient of various Awards and Honours, ex. “Richard Maling Barrer Prize” of the EMS, Academician Semenov Medal of Russian Academy of Engineering Science, MIAC International Award for his contributions in the field of Membrane Science and Technologies, etc. He is author of more than 800 scientific papers, 22 patents and 24 books on Membrane Science and Technology.